Zeds Dead posted on their Facebook the news of uncovering a remix they did a few years ago which never surfaced. You can get this track on their SoundCloud. Notorious for their sick drops and intense wobbling bass, this Canadian duo is throwing us a curveball with a FREE release of their mix of the Bon Iver track called Woods. 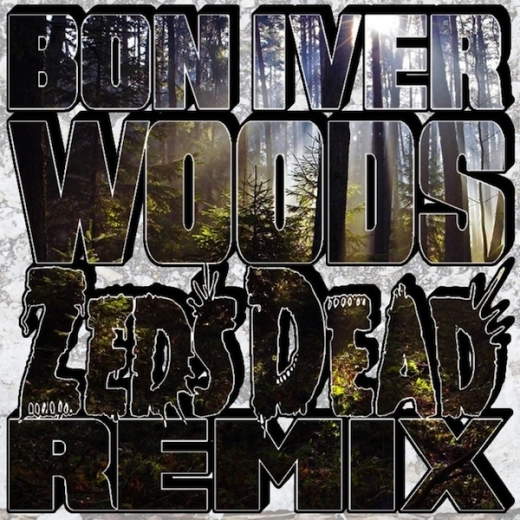 While Bon Iver and Zeds Dead may seem to come from complete opposites sides of the music world, this remix blends the styles of both artists beautifully. The members of Zeds Dead have experimented throughout their careers as producers with different styles and, as a result, of their influences (Sublime, The Beastie Boys, etc. ), have led their sound to be defined in more ways then one. At first, one might be expecting a mix sounding similar to Zeds Dead's more typical styles of suspenseful build ups into agonizing drops or maybe one of their deeper, heavier tracks with haunting vocals heard in the first two tracks listed. Especially since they are extremely well-known for the intensity produced into their tracks. Anyone who has had the privilege of experiencing the overwhelming energy DC and Hooks bring out with them on stage like I did this passed summer at the Electric Zoo After Party knows the feeling is unforgettable and the vibe they give off is unable to be replicated. The overall intensity is, without a doubt, still one of the most prevalent elements of this track but, Zeds Dead's remix of Woods seemed to be blissfully addicting. Still preserving the uniqueness of Justin Vernon's vocals, Zeds Dead's traditional elements really give you a great idea of the development their own style has undergone in the last few years to produce an unexpected but, refreshingly tranquil vibe that will leave you wanting more.